Pretty much everyone who knows me knows I’m a Margarita connoisseur with an obsession bordering on addiction, but when summer temperatures start to rise I start craving Mojitos instead. It all started when Teacher bought some Mojito flavored coolers for me to try. Since I can’t stand mint in any form except gum I was positive I wouldn’t like them. But to be a good wife I tried one. To my great surprise I actually liked it. A lot. Teacher, being the most wonderfulest husband in the whole world, searched for the best Mojito recipe so he could make Mojitos for us at home. We prefer to make food and drinks at home whenever we can – it’s cheaper, and healthier because we avoid the additives and chemicals in processed products. 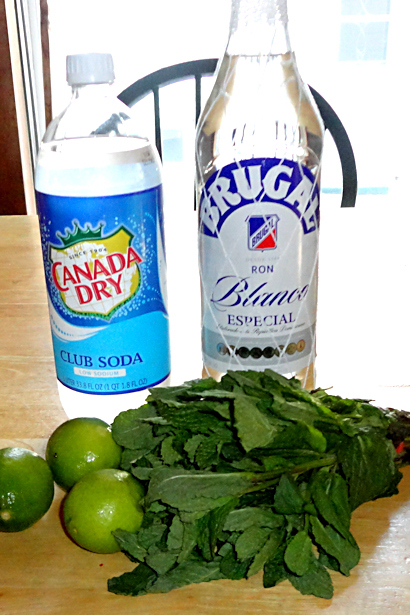 As always, higher quality ingredients will yield a higher quality Mojito. If you’re looking to save a little money, opt for a cheaper club soda and spring for the better rum. We haven’t noticed a huge difference in club soda brands, but a cheap rum is a waste of money. Besides, if you use enough rum it won’t matter what club soda you use, right? Assemble your ingredients. If your local supermarket doesn’t have fresh mint, try a farmer’s market or an ethnic store. Our usual grocery store was out of mint but we found some at a nearby Hispanic grocer. Or grow your own! This is my first year growing mint – I hope it grows as quickly as it’s supposed to. 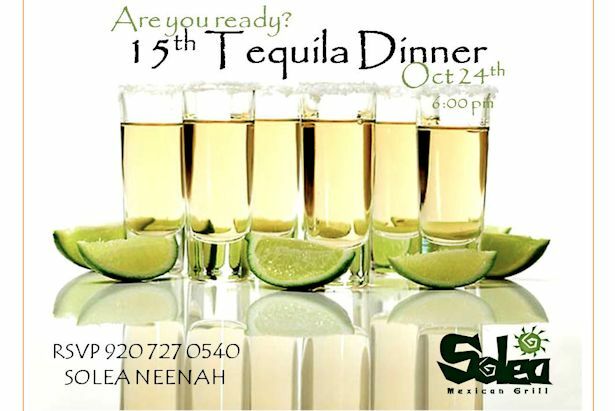 Slice the lime half into 4-6 wedges and place in the bottom of a glass. Add the mint leaves. 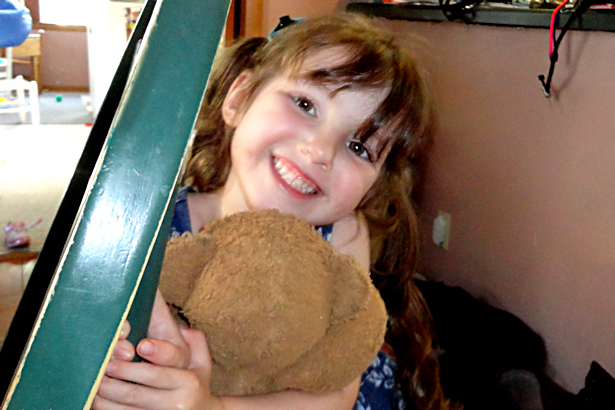 Peanut saw me taking photos and said “Gramma, take a picture of ME!” How could I resist? 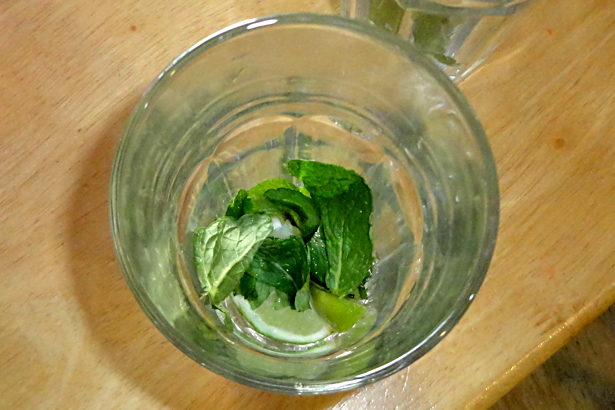 Muddle aka smash the living daylights out of the lime and mint leaves. 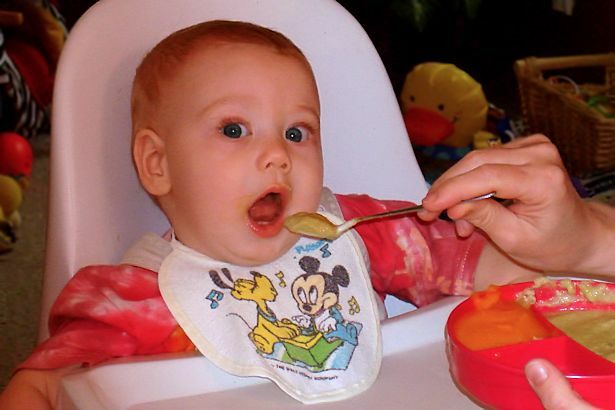 You could use various cooking implements to do this, like the handle of a butter knife or a wooden spoon, but a muddler is really the best tool for the job. See, now they’re all squished and juicy. 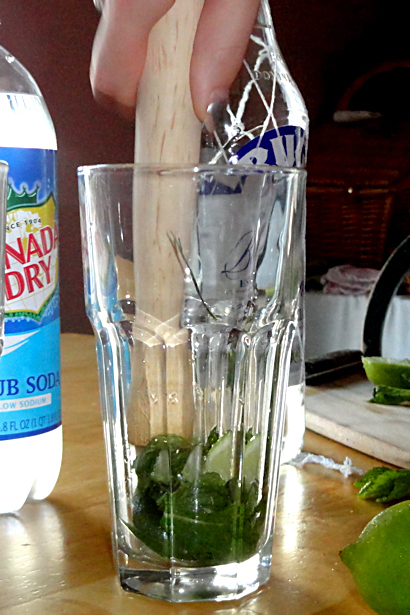 I think muddling the lime and mint a lot makes the best Mojitos because it brings out more of their flavors. Pour in the rum. I like to substitute dark and spiced rum in my Mojito recipe now and then, but Teacher generally prefers traditional white rum. Add the simple syrup or Agave, as in the next photo. Simple syrup works better than sugar for sweetening cold drinks because sugar doesn’t dissolve in cold liquids. Simple syrup is just pre-dissolved syrup so it mixes in easily. To make your own simple syrup, combine 1 cup of sugar with 1 cup water in a saucepan and bring to a boil. Turn the heat down and simmer until the sugar is dissolved, about 3 minutes. Remove from heat and cool. Store in refrigerator for up to one month. 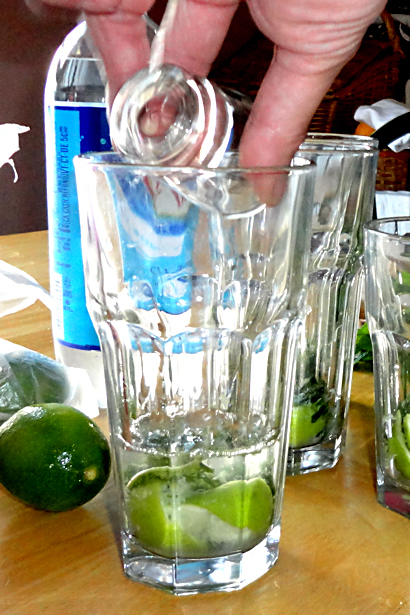 This year we decided to try Agave instead of simple syrup to sweeten our Mojitos. 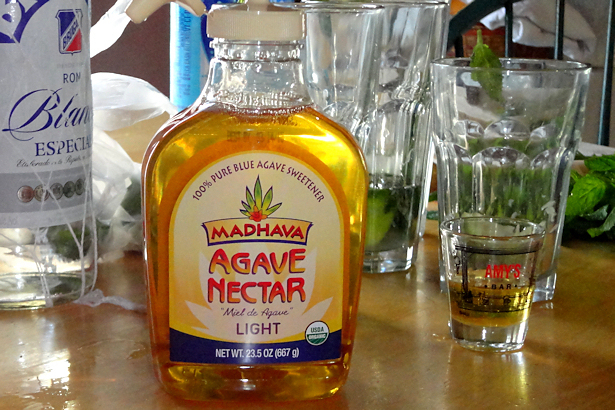 We chose light Agave because the bottle says it doesn’t add any taste, and it works great! You don’t need as much Agave as simple syrup, so start with about 2/3 the amount and adjust as needed. 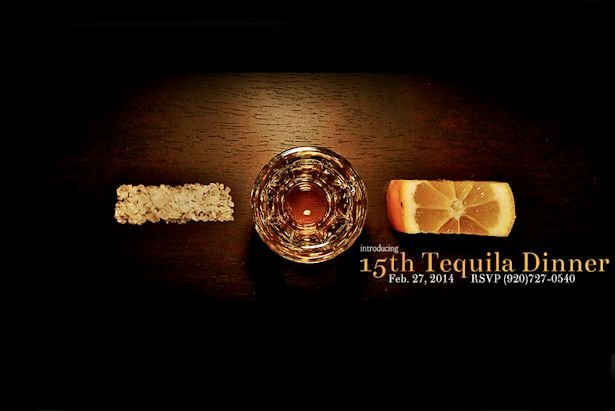 Did you know that Agave nectar comes from blue agave, just like Tequila does? 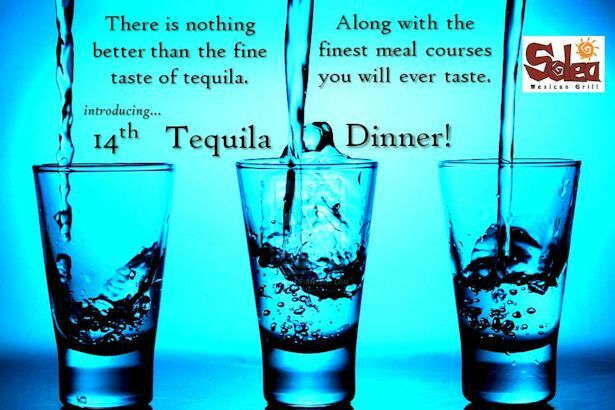 So that means that Agave is kind of like Tequila’s baby sister. Tee hee! The sweetener will be the heaviest liquid so it’ll sink to the bottom. You can mix it into the rum now, or wait until the end and mix everything together. Add ice to the glass. We prefer large cubes but you can use crushed if you like. Pour in the club soda. 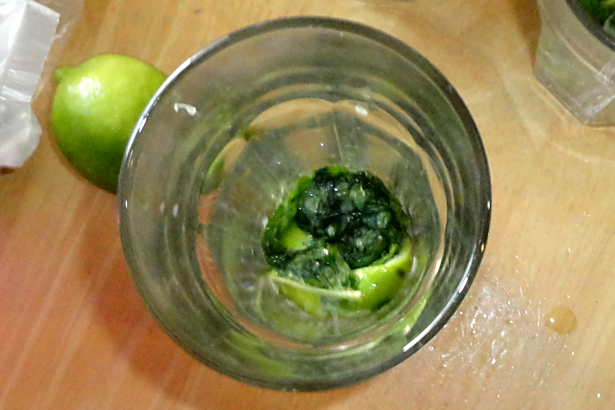 Give it a couple of stirs to mix the flavors, but be careful not to mix too much or you’ll lose all your fizz. Taste, and adjust ingredients as needed. I prefer a sweeter Mojito so I usually add an extra squirt of simple syrup or Agave to mine. We generally only make Mojitos on the weekends, and have learned that club soda doesn’t keep its fizz from one weekend to the next – even when we put the top on really tightly. Since I think the best Mojito is a fizzy Mojito we buy small bottles and open a new one each weekend. Mmmmm! 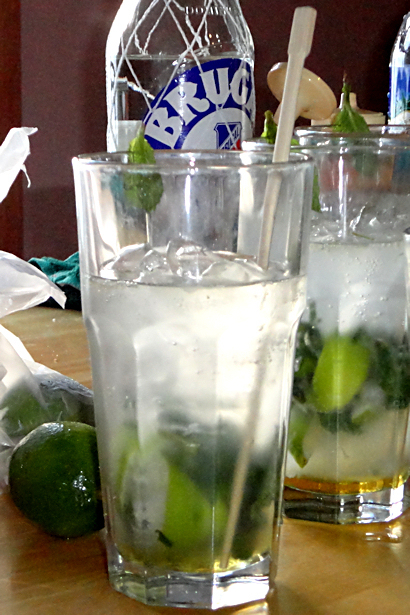 Mojitos on a Saturday night… Time to sit back, put my feet up and relax. 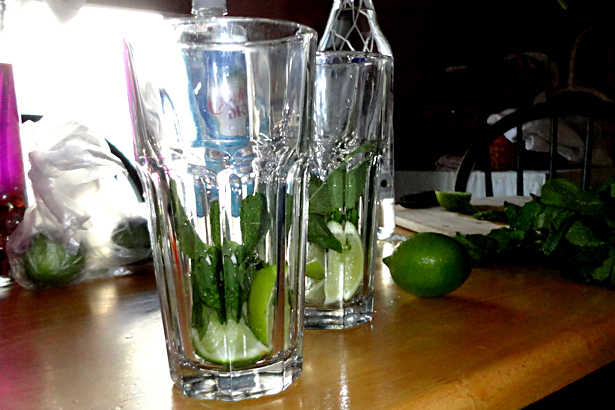 Oh, by the way – you can make virgin Mojitos by omitting the rum, like we did in the smaller glass for Jo-Bear. 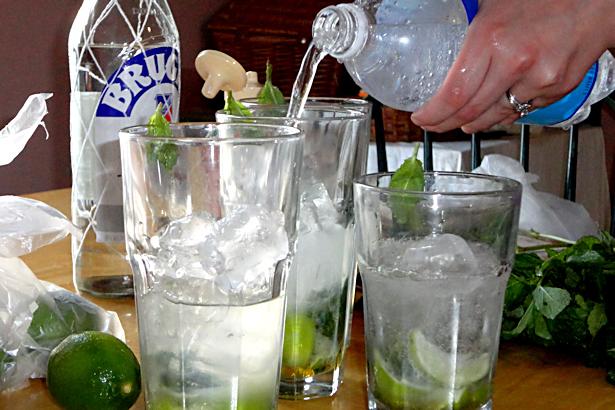 After you try our Best Mojito Recipe let me know what you think of it! Do you prefer a sweet Mojito like me? Or one with more Club Soda? Less lime? Blasphemy! Some other way? Send me your variations! 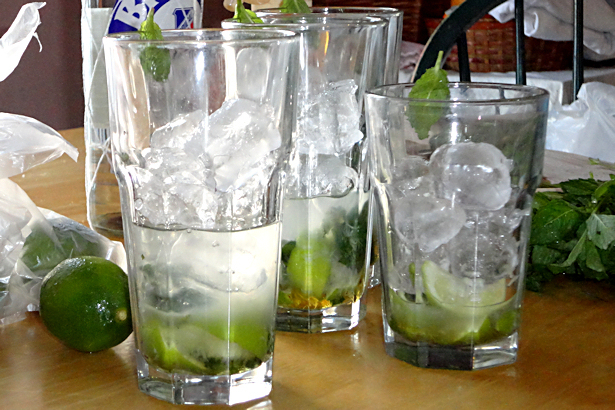 Love the mojito recipe. 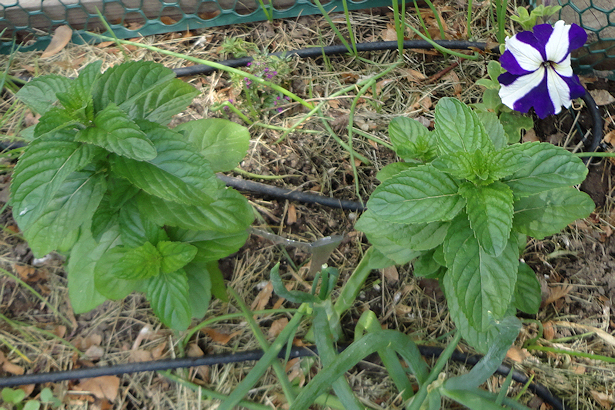 One caution about growing mint…it is like a weed and will take over a garden and is then difficult to eradicate. Better to grow it in a pot. Most definitely! I pulled out about half the mint that came back from last year and still have plenty. Catnip is the same way – I’ve given up trying to contain it. I let it grow wherever it wants, then let the kiddos pick some for the cats every day when we come inside for lunch. It’s a win-win situation for everyone!